What could be more summery than a gin and tonic? 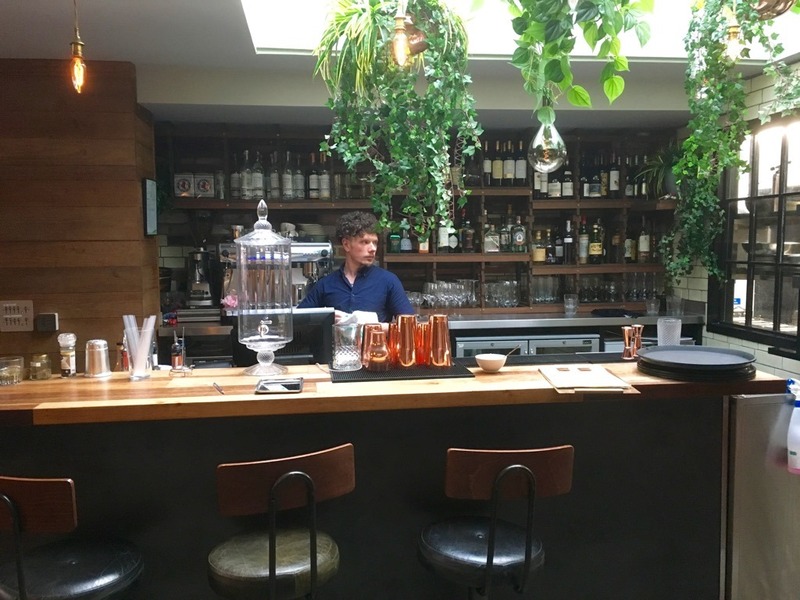 The days of a simple Gordon’s and Schweppes are long gone and these days the humble G&T is at the forefront of cocktail development and experimentation. 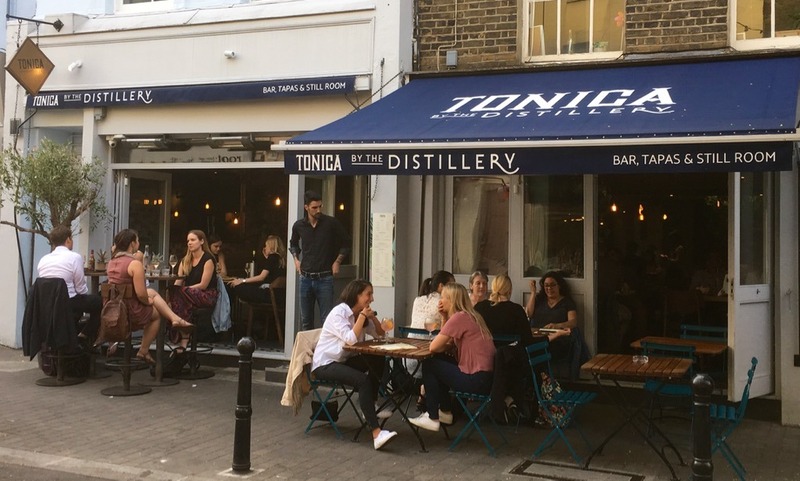 So in the spirit of progress, I was very pleased to be asked by London’s own prize-winning Portobello Road Gin and The Distillery (aka London’s Gin Hotel) to review their exciting new bar and restaurant venture, Tonica By The Distillery at Exmouth Market. 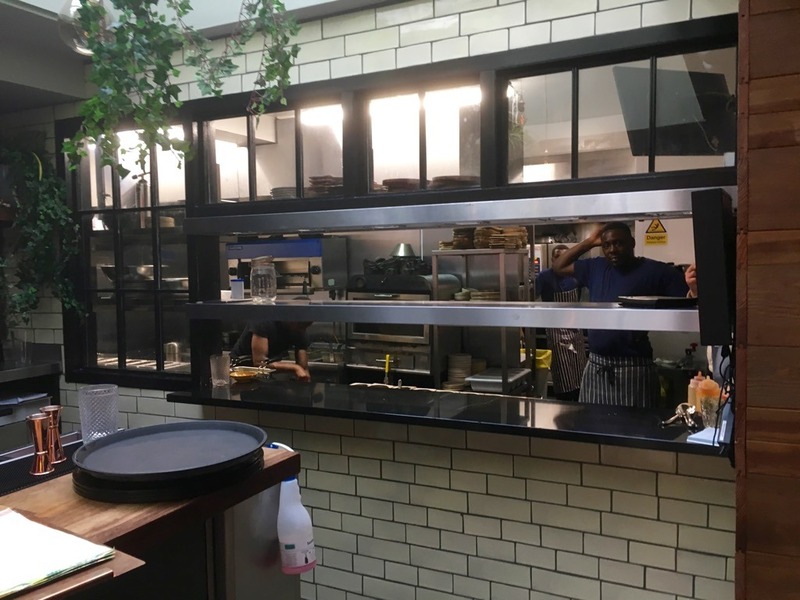 Tonica By The Distillery opened in April 2018 taking its inspiration from GinTonica, The Distillery’s first-floor Spanish restaurant. With external seating, the new 100 cover bar and restaurant serves a small plate sharing tapas menu with the bar specialising in their signature Gin and Tonic Plus cocktails. 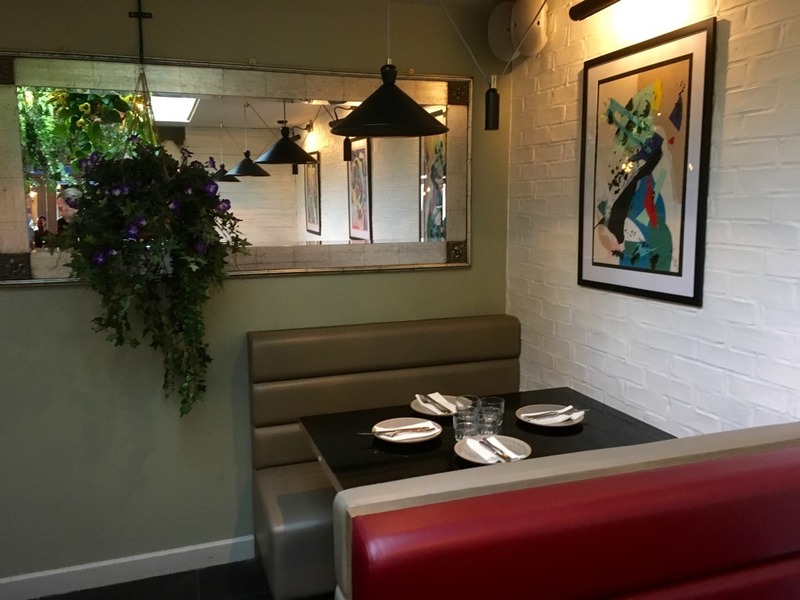 Tonica has the feel of an upmarket Spanish restaurant with white walls, posters and paintings, patterned tiles and hanging flower baskets all adding to the ambience. There is also an eclectic but well-curated playlist from Bowie to Van Morrison giving an unexpected and welcome retro vibe. An exciting future development will be the opening in the basement of a working Still Room with a 30l alembic copper Still entitled Copernicus the Second, used to distil the very first bottle of Portobello Road Gin, producing some of The Distillery’s artisan, house-made spirits. These will include an avocado vodka, butter gin and horseradish and rosemary vodka. Imagine – fresh gin!! Tonica’s drinks menu has been curated by Portobello Road Gin’s master distiller, Jake F Burger who has created their signature Gin and Tonic Plus which is described as “an experimental new serve that uses fanciful garnishes, interesting tonics, bitters, tinctures, fresh herbs, juices, jams and even liqueurs, to take the classic ‘spirit and mixer’ to dizzyingly delicious new heights”. In the interests of research, I tried three; the Nordés Atlantic Galician Gin – a blend of Nordes Gin, Merchant’s Heart Hibiscus Tonic, Hibiscus Liqueur and ginger bitters garnished with an orange wedge and edible flower which had a deliciously floral hint of sweetness. My favourite was the Rives Special – a more savoury, herbal concoction of Lacuesta dry vermouth and olive bitters, served with Fever Tree Mediterranean tonic and garnished with dehydrated orange, olive and rosemary. The most intriguing one for me was the Portobello Road no. 171 Gin – mixing together Pamplemousse liqueur and grapefruit marmalade, with the extraordinary Nordic mist blue tonic water garnished with a grapefruit slice, juniper berries and hops. I really loved Tonica’s Gin and Tonic Plus menu. The drinks were beautifully balanced with intriguing flavour combinations and I will be returning for more! Tonica’s food menu has been created by Executive Chef, Greg Lewis who has put together an alluring list of classic Spanish dishes. Whilst looking at the menu we started with a couple of items from the Snacks menu. 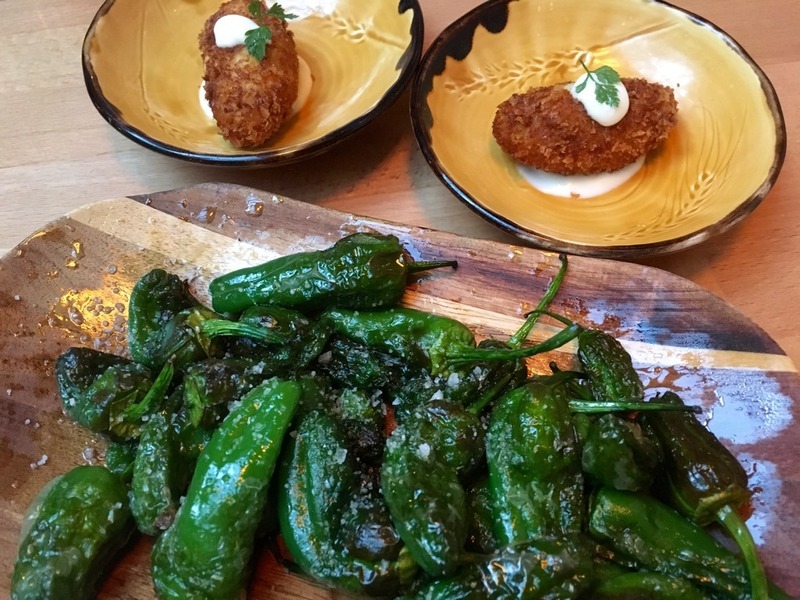 Padron peppers with Basque salt were perfectly done and Croqueta de Jamon had a soft creamy interior with a crunchy outside. It’s wonderful to have reasonably priced tasty bar snacks. 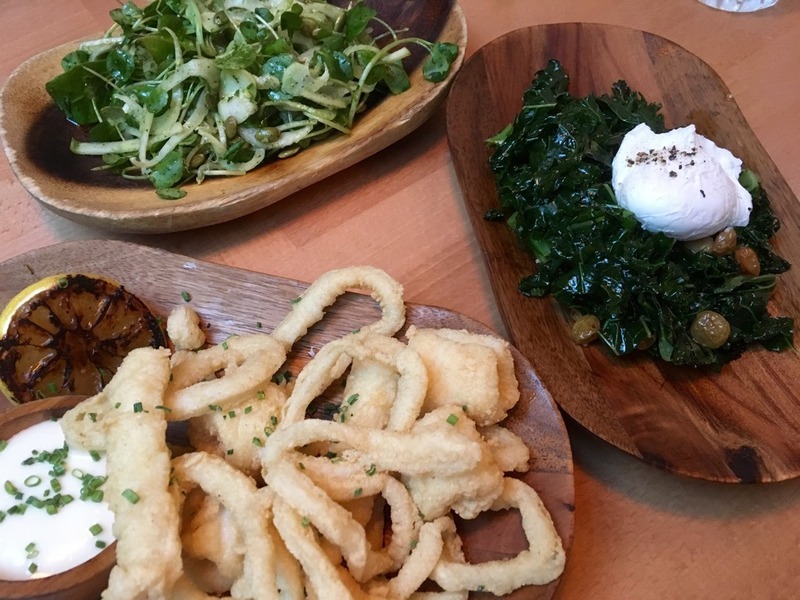 And then the small plates started coming…Kale was served with that classic Spanish sweet-sour combination of golden raisins with a sherry vinaigrette, given crunch by Marcona almonds and topped with the richness of a soft and runny poached duck egg. I loved this dish! A slight miss was the classic fried squid with ink aioli. It had sat for a bit too long as the squid was a bit limp but the aioli was suitably poky. A green salad constructed out of baby leaves, fennel, apple and seeds was fresh and textural. 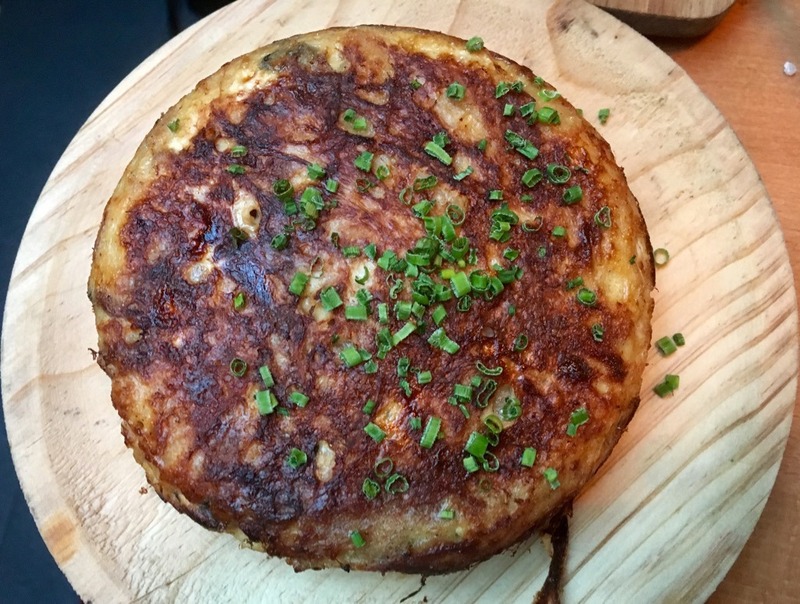 The Basque Tortilla was a dense satisfying affair, flavoured with wild mushrooms and caramelised ‘ five-hour onions’. Blackened leeks came in a vermouth vinaigrette and with almonds. 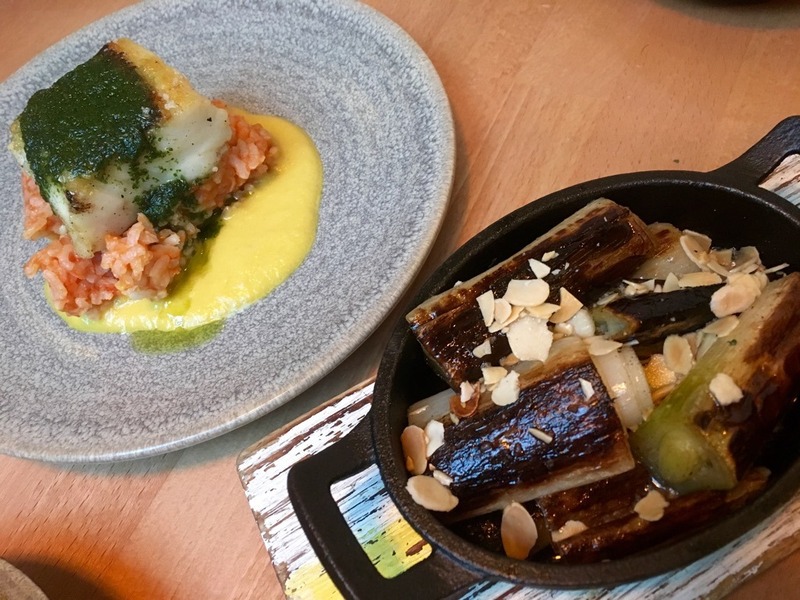 I loved the idea of this dish but for me, the leeks were too thick – calçots might have been better. However, a dish of perfectly cooked hake, a sadly underused fish in the UK, with tomato rice and an amazing yellow pepper purée was a revelation. I had never eaten a yellow pepper purée before and it was a great foil for the hake. Risotto Vasco was a bit of a confusion. 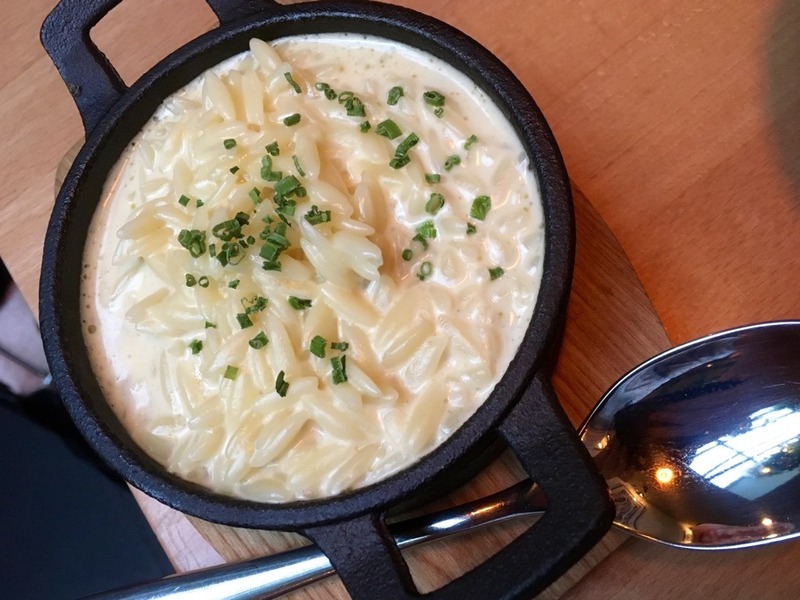 Normally it is made with long-grain Vasco rice but here the grain was listed as orzo – a shortcut pasta. It was, however, perfectly cooked with a bit of bite and a slight smokey cheesiness from the Idiazabal but with no sign of the listed truffle. I didn’t have much room for dessert so we ordered two. 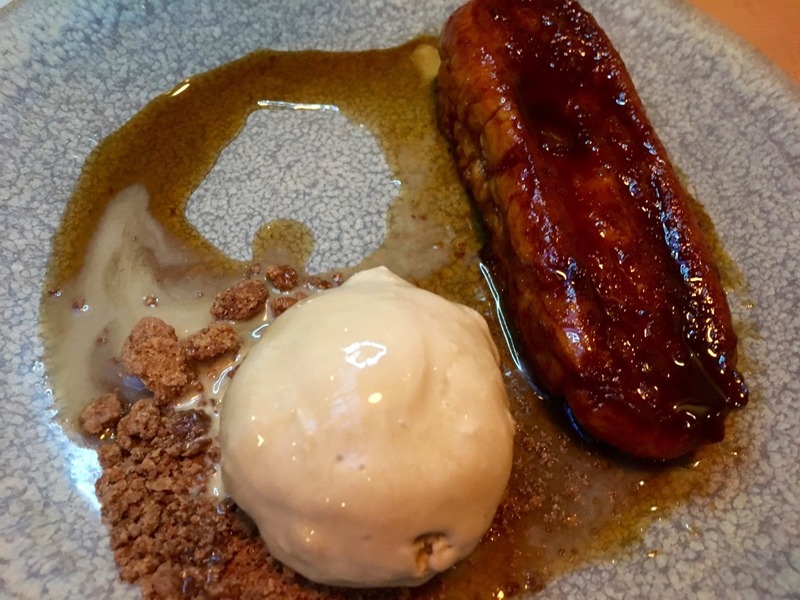 Torrijas was a scrumptious caramelised French toast with a creamy coffee Cortado ice cream. The classic Spanish Flan was another triumph. 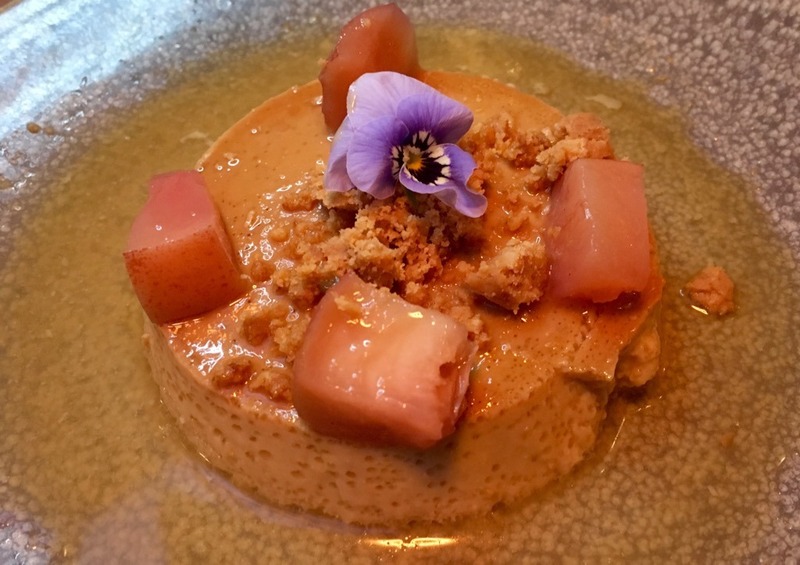 A creme caramel-style custard with roasted peaches, sherry caramel and Turrón, the southern take on nougat. With the addition of a dedicated event space with a program of unique experiences curated by The Ginstitute coming later in the year, there is clearly a lot still to come from Tonica. 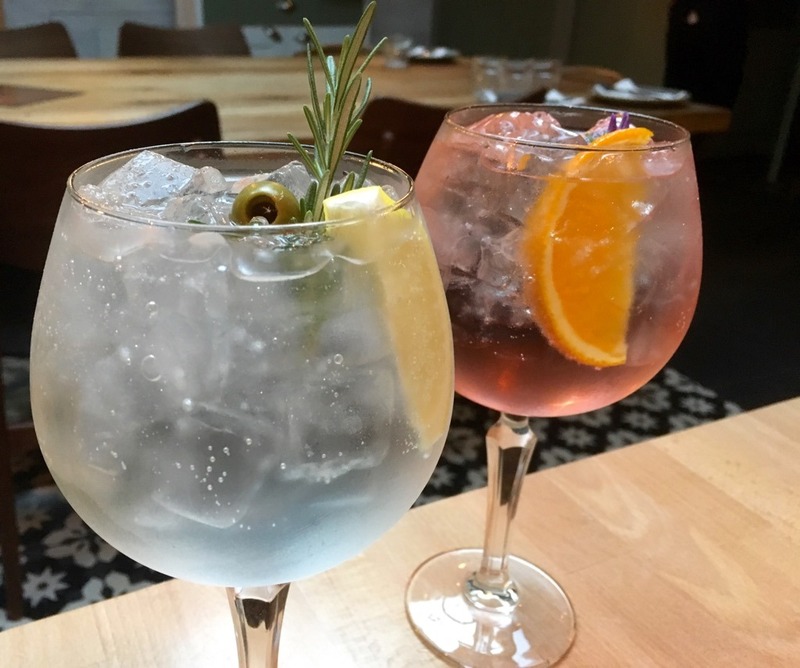 As it is you should visit and try the Gin and Tonic Plus menu and enjoy the food which has some unusual and delicious options. I’m there next month – I will be looking this place up!